As became abundantly clear on Friday afternoon, the coalition of councillors who came together nearly a month ago to rescue light rail from the dust bin of Toronto’s failed transit projects is facing a new and urgent challenge. On Monday, city council will debate wholesale changes to the TTC board, including a proposal by current chair Karen Stintz to dissolve it and reconstitute a new board with seven freshly endorsed councillors (four citizen members would join the board later this year). This, in turn, is a response to Rob Ford and his Executive Committee allies, who want to shift to a board where citizen appointees hold the majority, or perhaps all of the seats. 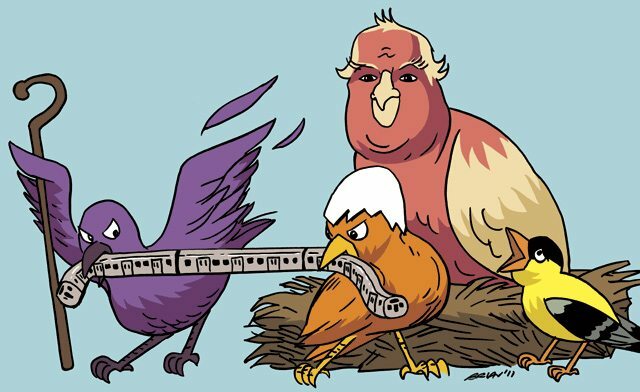 If the coalition is to ensure their light rail decision sticks, they will need to show the same kind of resolve and unity on Monday that they have demonstrated previously, set aside personal ambition, and agree on a slate of candidates that can ensure that light rail decision is implemented properly. The cost of failing: lose all the momentum that has developed for evidence-based transit planning, and cede a great deal of ground to Ford and his fiscally irresponsible, ideologically blinkered commitment to build underground, or nothing at all. The risks inherent in Monday’s vote became apparent last week, when the coalition that supported light rail revealed itself to be uncomfortably disorganized. The Globe and Mail reported that Councillor Josh Matlow (Ward 22, St. Paul’s) had worked with Stintz to create a slate of councillors that they would be putting forward as the proposed new members of the TTC board. That list—which the Globe got from Matlow, and which it reported he had passed along with Stintz’s blessing—included the four existing TTC board members who had supported Gary Webster (Stintz, John Parker, Peter Milczyn, and Maria Augimeri), along with three others: Glenn de Baeremaeker, Joe Mihevc, and Josh Colle. That slate—comprised of three left-leaning councillors and four centre-right councillors, and included representation from all four regions of the city—would have stood a good chance of being approved by council had it come before council. Unfortunately, minutes after the news broke, that plan fell entirely apart. First Josh Colle said he didn’t think Stintz would put forward any such proposal. Another councillor on the slate didn’t know they were on it until they learned of the Globe‘s article. And by the end of the afternoon, Stintz issued a statement in which she said she would still move for the seven councillor, four citizen plan, but not propose any slate of candidates to fill the TTC board seats. Debates on the floor of council can be messy at the best of times. Debates when 44 individual councillors are potentially angling for one of the most influential assignments available to them, without any concerted plan for apportioning those seats to reflect political or geographic diversity, are doomed to devolve into shouting matches in which everyone loses sight of the larger goals in play. The TTC needs a board which is stable, and which is aligned with the will of council. To that extent, Stintz is right to propose that the board be dissolved and remade. In light of last month’s light rail decision—a vote which council endorsed and the TTC board’s members rejected—the current situation is untenable. As we saw with Gary Webster’s dismissal, this is a TTC board that is actively seeking to undermine the decisions of city council, and that way further chaos lies. Council has taken a while to find its footing as it tries to navigate the contentious mayoralty of Rob Ford. As attested to by the repeal of the Vehicle Registration Tax, when only six councillors opposed Ford, many even left-leaning councillors were willing to back him on issues that were central to his candidacy in his early days in office. But ever since Doug Ford showed up one day with fantastical plans to replace mixed-use waterfront development with Ferris wheels and monorails—sacrificing years of careful planning and community consultation on an altar of impatience and faith-based mathematics—they have shown themselves increasingly confident in their voices, increasingly capable of bridging political (and sometimes personal) divides to come to consensus on key issues. It isn’t the same group every time—Stintz supported the mayor on his budget, for instance—nor does it need to be. But over a sequence of key decisions (the waterfront, the budget, light rail, community housing) we’ve seen a stable and growing alliance of councillors who are earning the trust their constituents put in them, by proving that they will decide based on evidence and constituent engagement rather than a show of hands at Timmies. This vote, about the composition of the TTC board, will be tricker than most. Appointments always are, for there are always more people who want the high-profile jobs than there are seats at the table. That is why this is the biggest test the coalition has yet faced, and why they run the largest risk of seeing the goals they share undermined. Some councillors will need, simply, to give up their ambitions. In a free-for-all debate, that is just not going to happen. The councillors who are committed to an evidence-based future for transit planning in Toronto need to settle on a slate of candidates for the TTC board, and they need to stick to it when they get to the floor of council. It won’t be fun, but it is necessary. Leadership doesn’t always mean taking the chair at the front of the room. Sometimes it’s the decision to let someone else take it.